Many good cooks I know are nurturers…and being so we want to please our family and friends with food they, hopefully, would enjoy. Last week I went to a neighborhood picnic toting some simple stuffed eggs. I know many of my neighbors enjoy good-old-fashioned American classics and my culinary skills obliged. Tonight a close friend is having a dinner party and I offered up a side salad to complement the Asian-style salmon she is preparing. The guest list is comprised of health- conscious foodies–many of them runners. (The only time you’d catch me running is when I spy that one remaining baguette in the bakery.) Edamame (Japanese soybeans) are packed with protein, fiber and antioxidents; soba noodles comprise an encyclopedic list of nutrients. 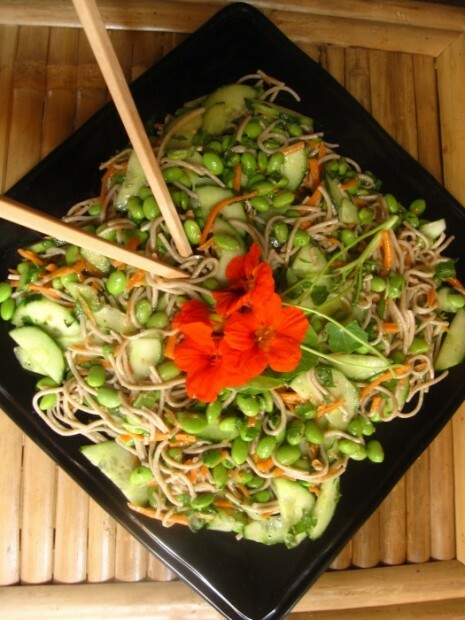 My soba -edamame salad will be sure to please! I’m in a big hurry so I purchased a good-quality bottled Asian dressing and will use that for my dressing. If you have time to make your own combine soy sauce, garlic, sesame oil, honey and rice wine vinegar to taste. I’m taking a little extra wasabi to put on the side in case some of the sushi-lovers want more of that screamingly good horseradish kick. 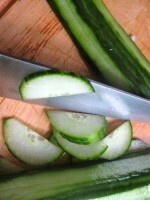 Bring two large pots of salted water to a boil. In one pot cook edamame, according to package instructions. In the other pot cook soba according to package instructions. Whisk wasabi and Asian dressing together, adding more wasabi to taste, if desired. Toss dressing with noodles, edamame, carrots, cucumber, mint and cilantro.